I remember in the early 80’s when I was about 8 years old I walked up to my dad and said “you know the year 2000 really isn’t that far away, and unless something changes we aren’t going to get jetpacks and flying cars.” Even then I could see the innovation curve wasn’t going to meet the expectations movies and books had set for me. Mostly I’m glad I reset my expectations at such an early age – since it is fairly rare that something comes along that makes me feel like I live in the future: things like the iPad and smartphones. Interestingly however, what feels most like magic to me these days – the thing I do regularly but that feels like it is the future – isn’t something I own, but a service that is all about whatI don’t have to own. A car. I actually belong to two car sharing entities: Modo (like Zipcar) and Car2Go. While I love both it is that latter that really has me feeling like I live in the future. What makes Car2Go so amazing is that unlike ZipCar and Modo, which have fixed parking spots to which cars must be picked up and returned, Car2Go essentially scattered 600 cars around Vancouver. There are no dedicated parking spots to which you must return the car. You can leave it anywhere in the city that isn’t private parking or metered. 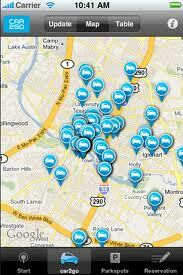 Fire up your smart phone and locate the nearest car – generally within 10-400 meters. Get in and start driving to your destination. I then automatically get billed at $0.35 a minute for use, so basically a 10 minute car ride (about the average length of a trip when in Vancouver) comes to $3.50, about $1 more than bus fare. I can’t even begin to describe the convenience of this service. What it saves me over having to own a car… mind boggling. Between walking, transit, car2go, modo, taxis and uber…. living without owning a car has never been easier, even with a 7 month old. But again, the magic is that, where ever I am in the city, I can pull up my phone, generally find a car within 2-3 minutes walk and drive anywhere I want without having to plan it all beforehand. There are, quite literally, cars scattered around Vancouver, at my disposal. Brilliant. Once you get into a Car2Go (they are all two seater Smart cars built by Mercedes-Benz) there is a little screen that allows you to control a map and the radio. The other day however, I noticed a little green leaf icon with a number in it, so pushed that “button” to see what would happen. Turns out Car2Go has a gamified driving. The onboard computer measures your performance around acceleration, cruising and deceleration and provides you with a score that reflects your performance. I took the photo below at the end of a ride the other day. 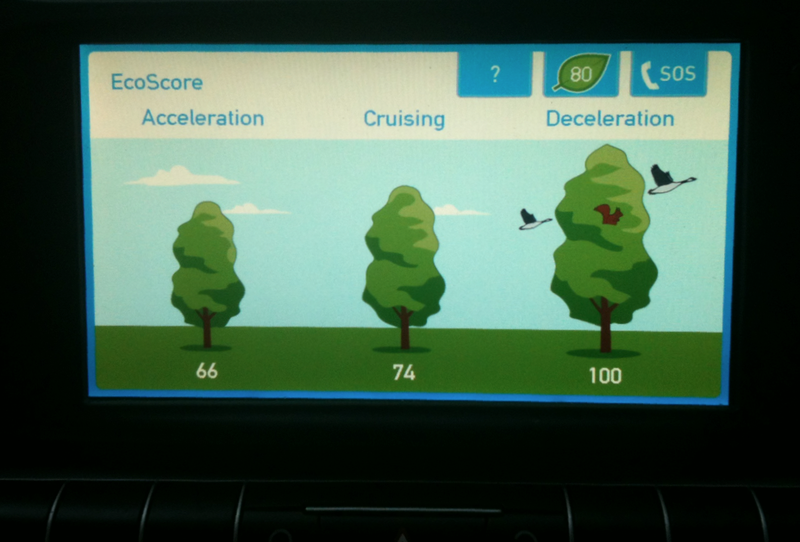 What determines your score – from what I can tell- is your efficiency around accelerating, cruising and decelerating. So the more smoothly you brake the gentler your acceleration (not an easy feat in a Smart Car) the better your score. Cruising appears to be about smoothness as well. Once you are aware of these scoreboard – even if you are not looking at it and it is only in the back of your mind – I find myself trying to drive more smoothly. In the subtitle, I point out that all this probably helps the environment by reducing the amount of gas consumed by Car2Go drivers. But I bet it also helps reduce maintenance costs on Car2Go’s cars. I’m sure many people are rougher on shared cars than they are on their own and that this gamification helps dampen that effect. Either way, if you’d asked my six year old self if I’d not own a car when I’m 35, and that I’d actually be sharing a car with hundreds of other residents that I could swipe into using a simple card and that had a game inside it that urged me to drive more sustainable.. I suspect I’d just looked confused. But using Car2Go is probably the closest I get, on a regular basis, to doing something I really couldn’t have imagined when I was 6. And that’s kind of fun. This entry was posted in cool links, technology, vancouver and tagged car2go, environment, future, sharing on July 23, 2012 by David Eaves.